My mother's family is from Saitama, a prefecture right to the north of Tokyo. Recently Saitama has become filled up with suburban commuter towns, but much of the prefecture is dominated by the Chichibu mountains, which feature prominently in Japanese literature. While that area is famous for its soba (buckwheat noodles), in the town where my mother grew up, Ogawa-machi (which isn't in the Chichibu area), everyone made teuchi udon, handmade udon noodles. I followed the general recipe my aunt used (her udon noodles were thick, a bit twisty, and delicious), but have adapted it so that I could make the dough in a food processor. This is a rather stiff dough since it only uses flour, water and salt, so using a food processor makes the kneading much easier. The key ingredient is the flour. If you can, get udonko (udon flour), which is a very high gluten white flour. Otherwise, use a high gluten flour such as bread flour. I used Zopfmehl, which is a high gluten flour used for making Swiss braided bread. All-purpose flour would produce rather soft, limp noodles which is not what you want. You want something that is chewy and substantial even after being cooked in the soup. The soup is a classic Japanese one made with dashi, soy sauce, and mirin, but the flavor is subtly changed by the aburaage. Naruto, a sort of fish sausage, is often added to this, but naruto is one of the foods I really don't like (it tastes like a lump of glue to me) so I've omitted it. This amount makes enough noodles for 3-4 portions, depending on how hungry people are. Put the flour and salt into the food processor. Add the water, and start up the motor. If the dough does not form a ball, add droplets of water through the feed tube until it does. Don't add too much though or your noodles will be too soft. Stop it as soon as a ball forms. The cut noodles - here they are a bit thick, though I like them that way. Take out the dough and roll it out on a floured surface, to about 1/2 cm / 1/6 inch thickness. Flour the surface of the dough, and then fold into thirds. Witch a sharp knife, cut into strips about 1/4cm to 1/2 cm / 1/12th to 1/6th inch wide - remember that the noodles will swell a bit after cooking. 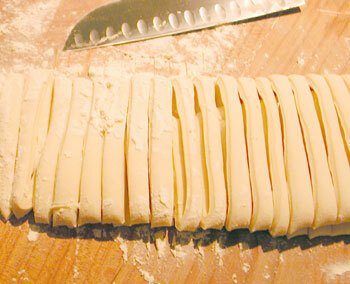 Separate the noodles and unfold them, stretch them out a bit and toss a bit of flour through them. At this point you want your water to be boiling already. In the meantime, heat up a pot of water. Do not add salt to the water - remember the dough is already salted. Toss in the noodles and stir to make sure they don't stick to each other, lower the heat slightly and cook for about 7-10 minutes, depending on how thick you cut the noodles. If the water foams up until it looks like it's going to overflow, add a little bit of cold water to it. Test the noodles for doneness - they should be a bit al dente, or have a bit of chewy core. Drain the noodles, then rinse well in cold water - this is to take off the starchiness on the surface and to firm up the noodles. Drain again. At this point it's ready to put into the soup. To make the soup, follow the directions for the soup for toshikoshi soba. You can also find ready made noodle sauce concentrate (in bottles) at Japanese food stores, which you only have to dilute with water and heat up. Also, if you have made the Japanese essence in a bottle, you can just dilute this at about a 1:6 essence to water ratio and heat up. To pretreat the aburaage (fried bean curd) pour some boiling water it - this gets rid of any excess oil. Drain, and put into the hot soup and simmer for at least 10 minutes. Add the noodles, and simmer for an additional 10 minutes, or more (the noodles just keep absorbing the soup and become yummier). To serve, top with slivered green onions and shichimi tohgarashi, which is described in the Toshikoshi soba recipe. Note: if you can't get the fried bean curd you can top off the udon noodle soup with a lot of other things: vegetables such as spinach, an egg, leftover tempura, etc. Tanuki udon for example is topped off with abura kasu, leftover bits of fried batter from a batch of tempura. There's even curry udon, udon topped off with a curry sauce. You can also simply put a lot more green onion on it and just eat it like that. Submitted by maki on 2006-01-28 11:05. I read once that the reason aburaage are called 'kitsune' is because foxes apparently reaaaally love themselves some fried tofu pouches. I wonder if that's true...? Wow! Homemade udon noodles sound fantastic and looks easy to make too. Thanks for the information regarding the name of the noodles - I've often wondered why the plain aburaage noodles were called kitsune. This recipe's a really good one. I think I have sloved the mystery of why it is called kitsune undon and it is that the aburaage is the favorite food of the mythical fox. can I use rice flour instead? If you make udon with rice flour, it may work...but it wouldn't be udon anymore. 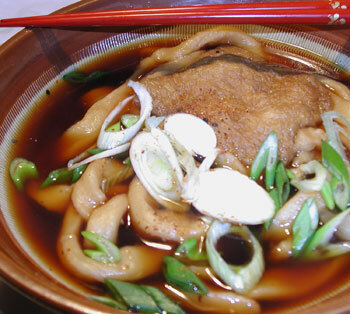 As a matter of fact 'udon-ko' (udon flour) is synonymous with strong white wheat flour. So...udon = wheat noodles really. But, who knows - the rice flour noodles may turn out great! Great recipe! I just made it, and it came out beautifully - just like back in Osaka/Amagasaki! I did have to add more water than mentioned in the recipe - probably about double. It may have been because if the high gluten flour. Still, the noodles came out perfectly - al dente, slightly chewy, and not at all soggy. Thanks! This looks delicious! I love your site...always read it during lunch break at work. I have a question about the broth. I've used bottled soup bases that yields dark color broth similar as shown on the picture above, and it tastes good. Then I went to a local restaurant that makes their own udon, and tried their tanuki udon. It was delicious! I don't know how they flavored the broth because it is very light, clear broth...just pale yellow color, yet so flavorful. Do you happen to know what's in it? I wonder if it is healthier than the dark broth (sodium-wise). Thanks! Pat, I am guessing that they started out with a very good dashi stock, and used light colored soy sauce (usukuchi shoyu) instead of the usual dark. (Light colored soy sauce is commonly used in the Kansai region (around Kyoto) while dark is used in most o the rest of the country, especially Tokyo.) A good dashi stock is the key to a good Japanese soup, and the bottled kind just doesn't live up to one made from scratch! Does it have to be a food processor? I'm a college student looking to make udon for a friend, and I can't exactly afford anymore kitchen equipment... is there anything special that I would have to do to mix the flour and salt-water by hand? does anyone have an idea where this can be ordered on the net? I have traveled as far as 100 + miles round trip to the nearest asian food stores and even they didn't seem to have it. Doesn't it come canned? I haven't found it online at any of the stores I know of, but maybe someone knows of a store I don't know about that carries it? Can you make it yourself? I mean, skin of bean curd, is that just the outer surface of tofu? Rhiannon: Have you tried looking through the Japanese grocery store listings for your area? Aburaage is usually only carried in Japanese or Korean groceries, not general Asian or Chinese (though Chinese markets have something similar that are often called 'tofu puffs'). Otherwise, i did find this on Amazon. You might try Japan Super if you are in the US too, and Japan Centre if you're in Europe. No, rice flour won't work - there are rice noodles (not in Japanese cooking but in Chinese and maybe other cuisines), but their texture is entirely different from wheat flour noodles. "Initially, two pieces of fried tofu were served. This was because deep-fried tofu was often offered to a pair of stone-carved foxes (kitsune) guarding an Inari shrine in the belief that it was their favourite food. The twin foxes symbolise the concepts of Yin (negative) and Yang (positive), and the beginning and end of the universe."